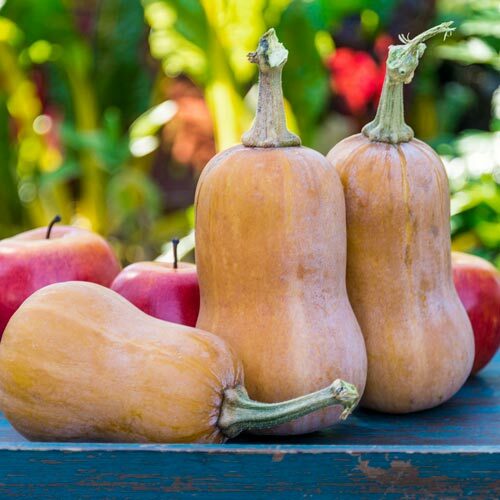 Honeynut Winter Squash | Gurney's Seed & Nursery Co. Developed by the Vegetable Breeding Institute at Cornell University, Honeynut is resistant to powdery mildew and its compact vine saves valuable garden space. This delectable winter squash has a sugary-sweet flavor, long shelf life and a 1-2 person serving size. Bake with cinnamon, pecans and real butter for a dessert-like entrée or side. 110 DAYS. Fruit5-inch, 1/2 to 1 lb. mini-butternut squash with uniform shape & size, ripens to tan skin with dense orange flesh. CommentsDeveloped by the Vegetable Breeding Institute at Cornell University. Honeynut is resistant to powdery mildew and its compact vine saves valuable garden space. This delectable winter squash has a sugary-sweet flavor, long shelf life and a 1-2 person serving size. Bake with cinnamon, pecans and real butter for a dessert-like entree' or side.